What is a Medical Marijuana Dispensary/Club? A medical marijuana dispensary or club is a place where people with a doctor’s recommendation can buy medical-grade marijuana, hash, oils, extracts, edibles and other cannabis-related items legally. Marijuana dispensaries and clubs are usually regulated by their local and state laws. To buy from such an establishment, you will likely need a Medical Marijuana Card, which is usually recommended by doctors for patients with chronic and persistent health conditions. What is a Medical Marijuana/Cannabis Dispensary? Medical marijuana dispensaries are quite different to the Netherlands’ coffee shops in many respects, although there are some similarities (e.g. the glass counters, bud tenders). In dispensaries, customers are not usually allowed to consume the cannabis on-site, and the general “vibe” in pharmacy-like. There are, however, private clubs and lounges where on-site consumption is legal, but these are not common for the moment. There is also a distinction to be made between a “dispensary” and a “club”. Not all marijuana clubs distribute cannabis. What they do is connect medical marijuana cardholders to those who are legally allowed to grow marijuana (i.e. “caregivers”, most often with medical cards themselves). These caregivers will often have their product stringently tested before having their marijuana approved for distribution by club members. Any club member thinking of sharing their own produce will be required to do the same. Clubs often charge for membership, and they may have a face-to-face consultation with a consultant in order to verify the validity of their condition, discern their patient’s needs and develop a “treatment plan”. Clubs may well have their own “clubhouse” where marijuana can be consumed freely. There are differences between medical marijuana dispensaries and clubs from state to state, as they are all constrained by different laws. However, the general aspects remain consistent, in that you are able to pick up your favorite strain(s) and edibles (which are not yet FDA-approved) with the appropriate identification, and take it away with you to consume at home or in a licensed clubhouse. 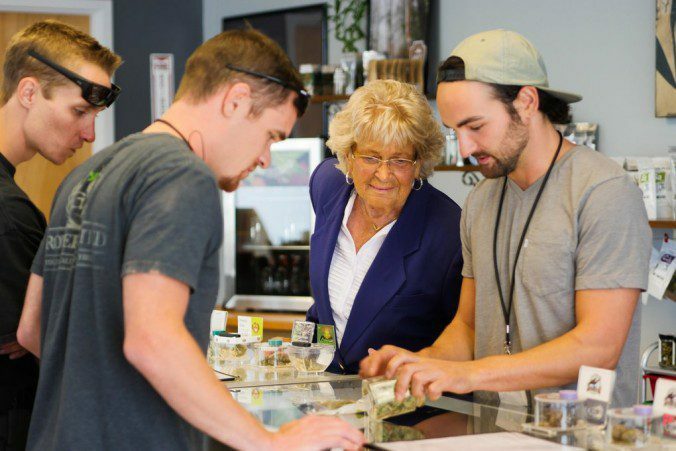 So, what is it actually like to buy marijuana from a dispensary? Unsurprisingly, it is not too different from going to a coffeeshop or specialist deli house, except you usually have to be over 18 or 21 (depending on dispensary) to get into one. Almost all dispensaries are accessible to the disabled and handicapped. There will likely be security guards and lots of cameras outside, too, in order to keep patients and the dispensary safe. The other difference is that you will often be asked to “check in” before you can order from the counter. This is where you get your physician’s recommendation and medical marijuana card checked. Were it not for all these factors, a dispensary would not look too different from any other store. One thing tends to run through the mind of first-time visitors: ‘this is a lot more slick and hygienic than I thought it would be’. Many people liken a dispensary to a pharmacist-meets-high-end-retailer-meets-nightclub (thanks to the security). Dispensaries are pretty much the opposite of head shops. They are brightly-lit, spacious and very clean. Many dispensaries will also have rooms providing other services for their patients. Dispensaries are keen to dissociate themselves from the popular image of back-alley cannabis shops of the past. They are particularly keen to show that their dispensary is there for patients to pick up medicine, so the comparisons to high-end pharmacists are apt. 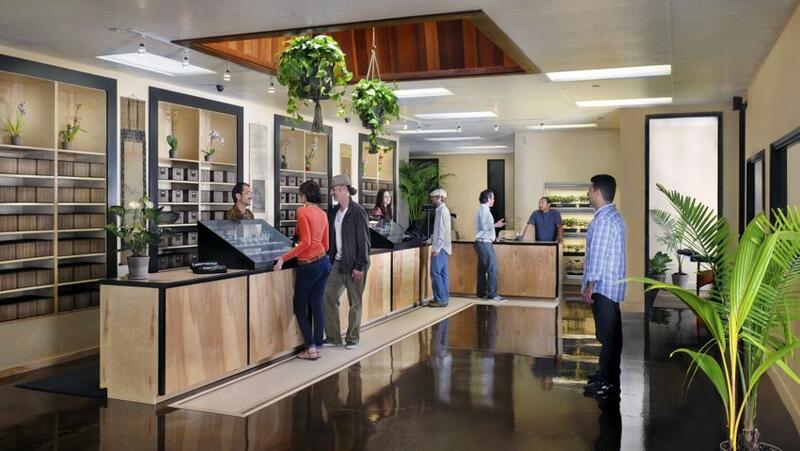 You will meet your ‘budtender’ behind a glass counter showing off the dispensaries flowers and concentrates. The budtender will also hand you a restaurant-like menu to peruse the full list of flowers, concentrates, edibles, topicals and whatever else they have available at the dispensary. Need a little guidance? We’ve included a list of recommended strains for different ailments here. You may also ask the budtender for recommendations and to see and smell the flowers yourself (good dispensaries will have terrine jars packed with marijuana for patients to inspect). Be sure to ask about any of the day’s deals, too, so you can get the best value for your product. Once you have chosen your strains and amounts, the budtender will measure them up, pack the marijuana into screw-top plastic medicine pots and a brown paper bag, then ask you to pay. Voila! You can now grab your medical marijuana and take it home with you to use as you best see fit. For those with a bit of a green finger and a favorite strain, many dispensaries also offer clones/cuttings of their most popular strains. Some dispensaries also have lounges, where patients can dab or vaporize with like-minded ladies and gentlemen while watching television or listening to music. Different lounges have different policies and ‘vibes’. Some will allow vaping-only, others may well allow dabs (smoking in any form is almost always a no-no, although some lounges are fine with it – just no tobacco!). Some lounges will have simple, no-nonsense, cafeteria-style setups with no music or other distractions – card or board games and talk are de rigeur in such places (how civilized!). Other lounges will have a more bar-like setup, complete with pool tables, junk food machines, jukeboxes and televisions, as well as hosting open mic and movie nights. Other lounges still will have a more comfy, living room-style settings with soft, cushioned chairs and a ‘homely’ vibe.